On Saturday, February 2, the Presidential Basketball Club 'Astana' will hold an away match against the Russian basketball club 'Avtodor' from the city of Saratov in the framework of the regular season of the VTB United League. «Avtodor» - is a Russian professional men's basketball club from the city of Saratov, founded in 1960. Undoubtedly, it is going to be a very difficult match, because of the Saratov thirst for revenge. On the eve of the new year, the teams have already met in Astana, where, in a very stubborn struggle, only over time, our team managed to seize the initiative and take a lead over the rivals. Both teams scored almost 200 points, score: 100: 83 (14:20, 20:25, 22:17, 22:16, 22: 5). 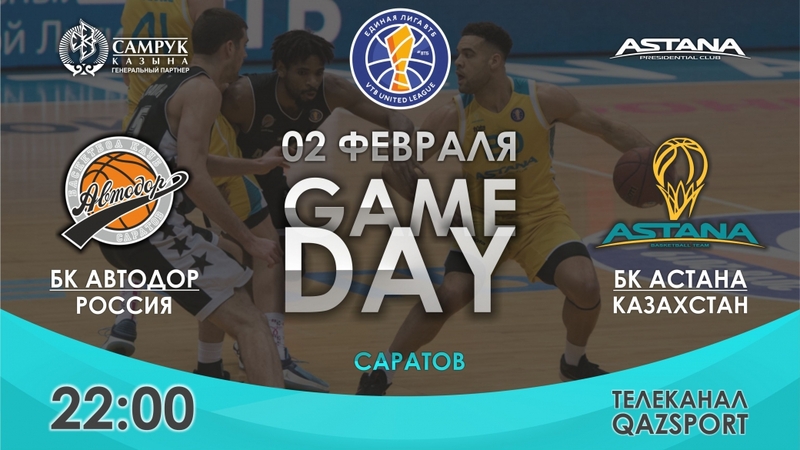 The match will take place on Saturday, February 2 in the city of Saratov at the arena of the Sports Palace «Crystal», beginning at 7:00 pm, Astana time. Live broadcast of the match will be available on our website in the Match Center section. Detailed information about the tournament, tournament tables, the schedule and results of matches are published in the section Tournaments.